freezer supply. My husband does his best to dodge the freezer-stored precious leaves waiting there for me! He's trying to get used to the leaves. Usually they are being steamed for EcoPrints. So, now my current leaves-in-waiting have taken new life. 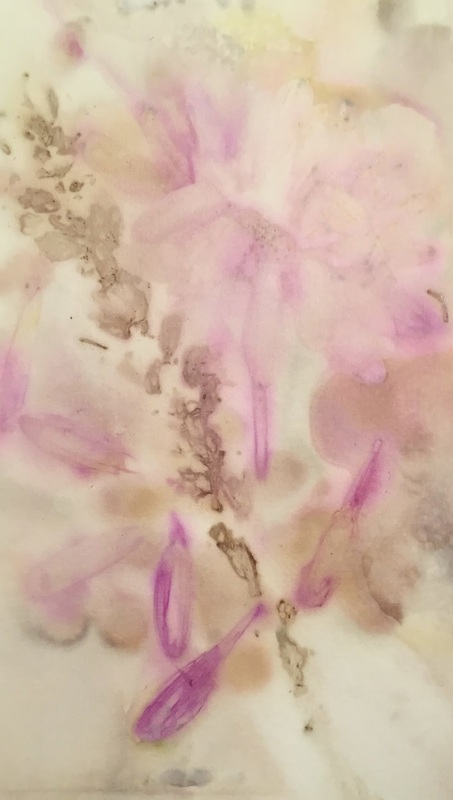 They now have marks of paint, markers, and Pan Pastel®, then encased in beeswax and polished to brilliance. 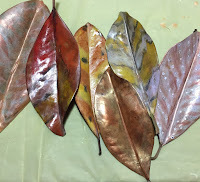 I've painted magnolia leaves before but the process of adding the pleasant-smelling beeswax is such a nice addition. Layering the wax and mark-making is a nice sensory experience. Ok....so now what do I do with them? I have ideas - always! Those that are completed are part of an artificial arrangement in a wicker plant stand that has needed some perkiness for quite awhile. I may also tie them into a garland. For a while some of them lived in a bowl of antique wooden kitchen tools in my house. They will move around probably, and it will be interesting to see how long they last. Some may get some lettering on them...others some more detailed marks. Someone else has probably done this with leaves long before me, but isn't it fun to explore on your own, not knowing if it's been done before? Thanks to Shari Replogle for unknowingly reminding me about Pan Pastel® and to Faith Evans-Sills in Lifebook 2016 for reminding this northern gal about Magnolia leaves. Let the leaves be reborn!